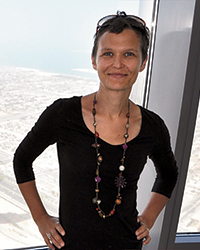 Profile German-born, Dubai-based Anja Schwerin often blogs about fantastic desserts that use alternative sugars and flours, like almond meal in a breakfast bread and coconut sugar in oatmeal cookies. "You'll also find raw, paleo and vegan recipes," she says. Because of the huge expat community in Dubai, she doesn't have trouble finding Western ingredients. "But I do cook with a lot more Middle Eastern and Indian spices than the average German would ever use," she says.